EMC's VCE converged systems unit is heading into hyperconverged country with new VxRail appliances that look and behave an awful lot like existing products from upstart rivals, but are promised to be simpler and cheaper. VxRail is indeed an evolution for EVO:RAIL. VMware, EMC and VCE aren't keen to associate the two, but VxRail uses the same approach pioneered in EVO:RAIL of presenting a simple, task-oriented user interface that pushes the grittier nuances of vCenter and ESX out of sight. VSAN 6.2 is indeed under the hood. And VCE is selling appliances, a marked change from the EVO:RAIL approach of writing a recipe and asking third-parties to provide their version of the hardware. VCE will offer six VxRail models, differentiated by core count. At the entry-level is the VxRail 60, a four-node, six-cores-per-node affair with 64GB RAM and 3.6TB per node. At the top of the range is the VxRail 280, a 112-core, 2TB of RAM and 76.8TB of SSD bruiser again composed of four nodes. It's possible to cluster up to 16 nodes of any model and scaling is promised to be a “oh look there's an option to add another box if I click there” affair, with no disruptions to endure other than a few minutes' wait for the new node to get into gear. Over 200 common items of sysadminnery have been turned into single-click affairs. The appliances will upgrade automatically and also phone home to VCE so it can do the machine learning for performance improvement thing. The product's tuned for desktop virtualisation, if required, a further point of integration with VMware which has provided the software to make the box hum. You can mix Flash and spinning rust, or choose appliances using one exclusively. Hybrid cloud options are, for now, restricted to backup and replication. There's vCenter under the hood, so cloud-bursting may not be far off. vMotion will be available, for appliance-to-appliance workload teleportation. VSAN is important because it means the storage can span several nodes and clusters, a point VCE thinks is more elegant than rivals' rigs. We're told that average price per node will be “under $50,000” as of now, but that revisions due in 2016's second half will mean VCE does “a lot better” than that. The arrival of VxRail means the EMC Federation now thinks it has all the converged hardware bases covered. If you really want to roll your own hyperconverged appliance, EVO:RAIL is for you even if VMware won't spend much time spruiking it any more. If you want something a little bit locked down and a little bit flexible, VSAN 6.2 is for you, running on the “ready nodes” - aka servers with lots of disk and I/O – that VMware's hardware partners will proffer. If you want turnkey appliances, VCE will sell you a vBlock or VxRack, then VxRails as satellite systems for remote or regional offices. VCE will happily support the lot, at the slightly maniacal level of down-to-every-driver-update that comes with vBlocks or the lesser effort required for the mostly idiot-proofed VxRail. Smaller companies will be urged to consider VxRail as they replace servers running vSphere. The new appliance will also be suggested as the upgrade path for EMC's VSPEX Blue converged kit. Letting EMC do the thinking for you, at least when it comes to hardware configuration and the joys of racking and stacking, is the Federation's plan. And even putative parent Dell isn't spared the anti-DIY messaging. Hey Dell, you smell. Love, EMC. Please keep buying us, okay? For now, however, Pavone thinks the Federation's done a grand job of pulling together a hyper-converged appliance that's very well priced and a natural for existing VMware users who want to keep using the tools they know rather than skilling up on something new. That's a shot at Nutanix and SimpliVity, both of which are doing very well with hyper-converged appliances that don't put vCenter or ESX front and centre. Nutanix, of course, is being more aggressive by offering its own hypervisor. 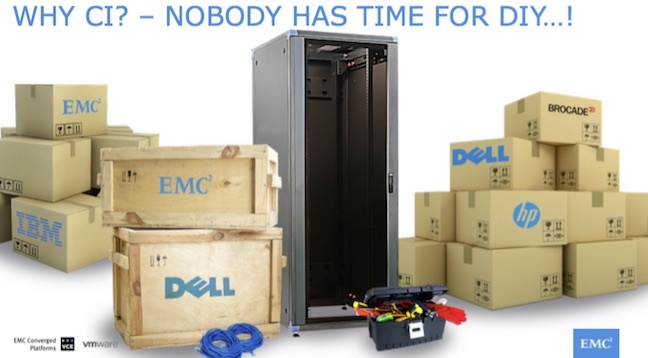 Pavone made it clear that EMC is going to go very, very, hard on price. A factoid we mention again because so did Pavone. Based on what we've been told about VxRail, Nutanix and SimpliVity have little to fear in terms of product comparisons. Whether the two startups will enjoy a price war is another matter. What's not in doubt is that business IT buyers like the converged approach, in most of its variants. The aforementioned startups are going very well. NetApp and Cisco have a nice little thing going with Flexpods, so much so that IBM's mimicked them. Oracle's making waves with its version of convergence. Microsoft's about to have a crack with Azure Stack having dipped its toes in the water with Cloud Platform System. HP will wade in after it with Azure-ified rigs. And VCE's come from nowhere to a $3bn annual run rate. The driver behind all of this is the cloud tail wagging the virtualisation dog. As more and more enterprises enjoy the experience of just having servers appear from the cloud, they want that experience with the on-premises kit they still need. The EMC Federation's well and truly having a go at delivering that experience now, in just about all extant market niches other than a direct FlexPod competitor. And this time it may be getting things right: one of the things that held back EVO:RAIL was that existing vSphere licences could not be moved to the new appliances. This time there's no such restrictions. No plan survives contact with the enemy, or users, so we can't yet say if the Federation has avoided other mistakes it made in this field – EVO:RAIL and VSAN were both under-powered and required revisions – this time around.